The Condition Of This PAM00112 Is Like New, As Close To New As You Can Get For a Pre-Owned Watch. Please Refer To The Pictures iN Determining The Condition, Pictures Are Of The Exact Watch Being Offered. This One Is A Q Series Which Implies That It Was Manufactured iN 2014. Only 1000 Units Were Manufactured iN 2014. Last Known Retail Was $5900. Case Is Made Of High-Polish Finished Stainless Steel And Is Equipped With A Transparent Sapphire Crystal Case Back Which Allows One To View The Inner Workings Of The Model. The Bezel That Is Mounted Atop The Case Is Made Of High-Polish Finished Stainless Steel As Well. Watch Is Water Resistant Up To 300 Meters (1000 Feet). Time Is Displayed On A Black Sandwich Dial With Luminous Hands And Hour Markers. 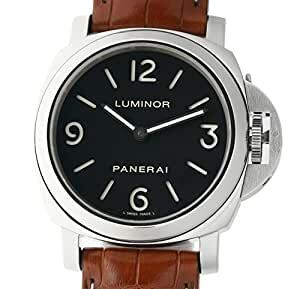 Mounted On The Watch Is A Like New Panerai Brown Alligator Skin Strap Which Is Attached To A Stainless Steel Panerai Tang Buckle. Powered By The Panerai Caliber OP X Manual-Wind Movement Which Has An Approximate Power Reserve Of 56 Hours When Fully Wound. A Full One Warranty And Certificate Of Authenticity Will Be Issued By Element iN Time NYC.. Buy with confidence knowing each timepiece goes through the same rigorous 31-point inspection. Rest assured only authentic parts straight from the manufacturer are used. The Certified Pre-Owned Program on Amazon ensures peace of mind and transparency via standardized reports and a 1 Year Warranty Provided by WatchFacts.